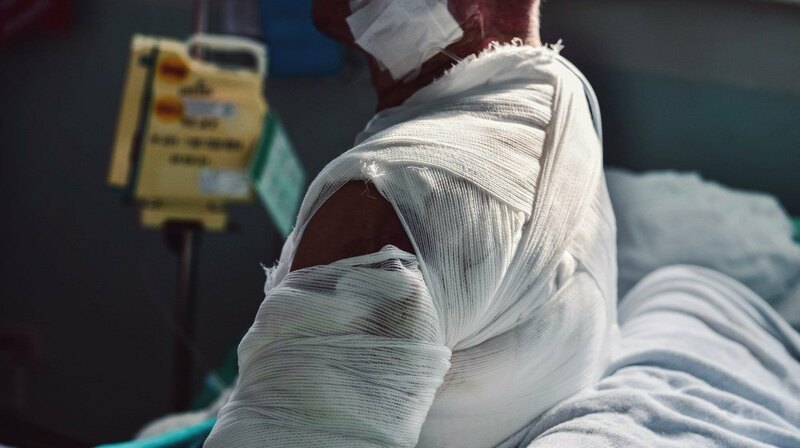 When a burned face, head or neck need reconstruction, it takes more than just the surgical team to help the burned patient. It takes physical and occupational therapists, psychological support, and social support. The face, especially, may need pressure dressings, the introduction of steroids to reduce scar formation and sometimes laser therapy for scars. Unfortunately for facial burns, there is no way not to have some kind of scar if the burns are deep. All that can be done is reduce the thickness of the scars or possibly exchange one type of scar for another type. Plastic surgery needs to be involved to maximize the aesthetic appearance of the face. Burn injuries of the face can be very disfiguring and can affect facial expressions, breathing through the nose, speech and vision. Pigmentation and texture of the facial skin can be very different following the burn. The goal of facial burn therapy is to have a normal-appearing face that has more scars rather than having a face with fewer scars that has lost its normal expressions. Mature burn scars tend to be more appealing than surgically excised scars, even if skin grafting or flap repairs are used. The face has a way of healing from a burn that doesn’t lend itself to surgical reconstruction in many cases. Even though the latest trend in burn care involves excising second and third degree burns and closing them over with grafts or primary closure, this type of treatment is less often done when the face is involved. The reason is that the face has amazing healing properties when it comes to healing the skin and cutting on the face for whatever reason has a large chance of making things worse. Moat facial burns can be treated with topical antibiotics, with healing taking place within about 3 weeks. Only in clear full-thickness burns should excision and grafting be attempted. It is acceptable to wait for 3-4 weeks to see what heals on its own before attempting major reconstruction surgery. The biggest problem with faces is that it is more difficult to assess facial wound thickness than it is in other areas of the body. Instead of surgery, silicone pressure masks and pressure dressings are used to minimize scarring. Doctors also use topical or intra-lesional steroid injections and the application of vitamin E to help the facial burns heal. Massage and the use of pulsed-dye laser treatments will help the visual appearance of the face after it heals from its burns. Superficial second degree burns heal within three weeks and do not often scar. Pigmentation usually stays the same and there are only minor changes in skin texture. Deep second degree burns, on the other hand, can have changes in pigment, texture and scarring of the skin. The goal of these deep second degree burns is to manage thickening of the scar as soon as it is appearing. Doctors can make use of computer-generated silicone masks that keep the level of scarring down. Third degree burns will likely result in severe contractures so that, in these cases, it is appropriate to excise and graft these types of burns unless they are very small. It can be tricky to determine the depth of a facial burn. It should be noted that the more severe the burn, the more likely it is to have contractures that alter the facial expressions of the burned person. There are two types of burn categories in facial burns. The first is the type I burn, which yields a normal face with only local scarring and minor contractions. The second is type II burns of the face, which show some or all of the typical stigmata of facial burns. Type I facial burns need to be treated as conservatively as possible. This is because doing surgery on these areas can create unwanted tension in the facial skin. Laser can be used to decrease redness of the face and skin grafts can be done on localized contracture. The use of laser and z-plasty surgical techniques can recreate the face into as normal a face as possible when they are used together. In type II burns, usually there are multiple surgeries that progress from the eyelids first and then the lower lip/chin area, the upper lip, the cheeks and finally the nose. A great deal of grafted donor skin is required. The basic idea is to put the facial features back in an anatomical place and to have few contractures so that the face can remain expressive. The best options for treating facial burns involve using a z-plasty technique, which allows for better elasticity of the face, pulsed-dye laser treatments that flatten thick-appearing scars, skin grafting, flap repair operations and the use of tissue expanders to get more skin for the best facial features following surgery. Surgery to the face can be acute, intermittent and late. Acute reconstructions are done on the eyelids and around the mouth. Neck deformities should be treated surgically in the acute phase of treatment. The anterior neck often needs splinting along with grafting and excisional releases. Intermediate-phase reconstruction takes place after the scars have matured and are soft. This can take years, depending on the depth and location of the scar tissue. Steroids are often used in the intermediate-phase period to reduce the thickness of the scarring. Late phase reconstruction is aimed at tackling thick and ropy scars using z-plasty and laser techniques. The biggest problem outcome in scalp burns is alopecia (hair loss). Depending on the amount of hair loss and its location, doctors can do scalp rotation flaps or follicle grafts to try and maintain as full a head of hair as possible. Other injuries that go along with scalp burns are burns of the eyebrows, nose and nose. These must be part of the treatment plan of scalp burns. Burned areas can be treated with disuse expanders on the scalp with the excess skin used to treat the face. Eyebrow burns with alopecia can be treated by grafting parts of the skin with hair behind the ears or with part of an uninjured eyebrow. The problem with using scalp hair is that it grows much more rapidly than the eyebrow hair and it doesn’t lay down flat like eyebrow hair does. Eyelids can be very difficult to do as the surgeon needs a lot of extra skin to properly drape the skin around the eyes to approximate normal eyelids. Sometimes many releasing incisions need to be made in order to get rid of contractions of the lids. Sometimes the orbicularis oculi muscle needs to be repaired and overlaid with abundant amounts of grafted skin. The nose can easily be completely burned off in a serious burn. In less severe burns, the nose is often shortened with loss of the lateral nares. Ears may need flap repairs unless the entire ear is lost; in such cases, a prosthetic ear is required. Anterior neck contractions are extremely common and need to be treated early on in the reconstructive process. Late contractures can be treated by splitting open the scars and inserting folds of donor graft skin.